WHY ARE DIGITAL Marketing Companies SO BAD AT UPDATING THEIR OWN SOCIAL MEDIA AND BLOGS? If you’re searching for a company to help you manage your digital marketing then you probably do plenty of research on them first... or at least I hope so. About two years ago I was searching for a digital marketing agency to work for and I started to recognize a strange trend: digital marketing companies don’t keep up with their own digital marketing. ​Not only was this discouraging from an employment standpoint, but I also imagined how a company or person looking to use these agencies would feel if they did their research. I'd give some examples but I don't want to effect the reputation of some very good companies. This isn't to say every digital company does this, but service-based agencies seem to be the biggest culprit. Myself included. If you happen to find yourself on Priority Digital's website (the company I work for), and go to the blog tab... you'll only find two posts. They were both from February of 2018. I made those posts when I started in my current position and my assumption was that content would be an important part of our sales strategy. Content is important. However, getting client-content finished is more important. When you're a small company of only a few employees and don't charge enough to outsource everything (or don't want to for service reasons), writing your own content falls lower and lower on the priority list. The only time I write articles or make videos now about digital marketing is in the late evening (like when I'm writing this). That time isn't always the most productive for me, and not only does the quantity suffer, but sometimes the quality of the output isn't up to par for what I expect either. To check in on my own content creation, I did some research. 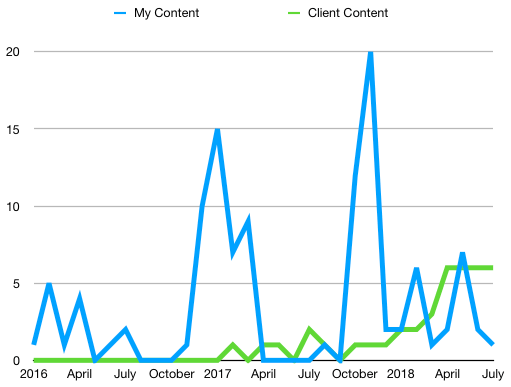 Over the last two years, I marked down how many pieces of content I created for my own websites vs. my client's websites. This graph includes this website, videos on my YouTube that are business-related, Priority Digital's blog, and www.Sideline-Pictures.com (the movie company that Vincent Barnard and I make movies through). The trend wasn't as dramatic as I had assumed, but this may be due to my spurts of creative inspiration where I create content like a mad-man for a few weeks and then disappear from the internet for a few months. That same strategy doesn't work for my clients-- obviously-- so their content output is much more consistent. Have you noticed this or disagree with me completely? Do you care if your digital marketing consultant or agency practices what they preach? Comment down below or @craiginzana on Twitter. This tutorial shows you how to set up the two way sync between ToDoist and Google Calendar. This works great as an online planner calendar. For years I've been looking for a system that works the way that this does! Finally, a software has met this major productivity need. The calendar layout allows a clean to do list layout spaced out by time like the half-hour by half-hour bullet journal type planners I used to use. With this digital version though, it's accessible everywhere (no forgetting my notebook!) and it's easy to move things around. If you don't want to watch the video, below are the key steps to making this work. I get asked about press contacts for our area often. Through my work with the Winkler Gallery and Art Education Center, Sunny 106, and Connect FM I've developed a list of local contacts that are worth reaching out to. Feel free to bookmark this page and come back often to send out your press releases. Why share this list publicly? Well, first off, these are all available to find publicly if you look hard enough. I'm not really giving away any private information here. However, I understand how frustrating it is to build a list like this by yourself. Blogging has become a huge part of having a successful website. Especially in Business to Business sales, having a good blog can bring sales to your doorstep. Additionally, blogging can answer those questions you get from customers and clients over and over and over again. In fact, that's how I have come up with my most successful posts. It turns out there are usually thousands of other people out there looking for answers to that question too. Follow these steps and track the amount of views your blog posts receive. You won't be disappointed. If you do really well, some of those views should turn into paying customers! Download the free checklist PDF to help you remember these steps. 1. will the topic add value? 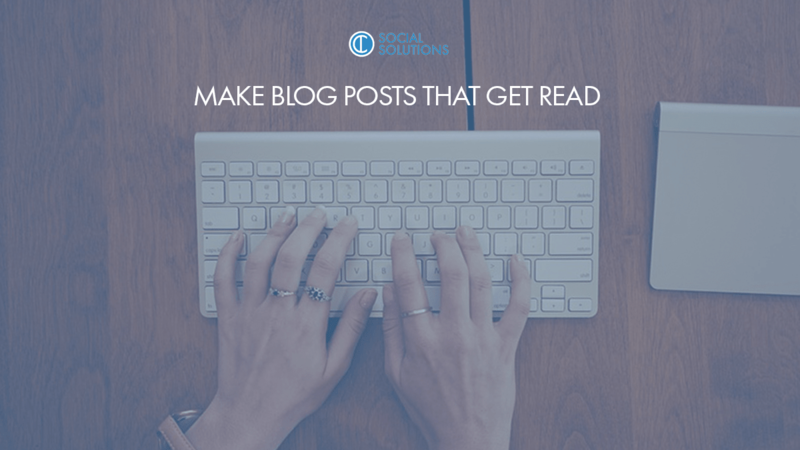 Before you do anything, make sure the topic of your blog post matches your target audience. It helps to imagine your IDEAL customer. What are they typing into that search bar? What blog post would they click on? What topic would be most valuable to them? Can you add a unique perspective? ​Will this make them trust you more and more likely to buy from you? There's an obvious "trick" to growing your YouTube views for free that has worked every since I joined in 2007. Now it's 2018 and I'm going to share this Fast, Free way to grow your YouTube audience and reach the people that actually want to see your videos, music, or whatever it is you're creating. I joined YouTube in 2017 and used the platform to develop as a video editor and digital marketer. It’s interesting because some of the trends that used to work to get more views online have come and gone but there is one that has consistently worked. Social media addiction is something I’ve struggled with for years. When I start to feel my thoughts influenced by those online and consuming content mindlessly constantly, then I know there’s a problem. In this video and blog post I talk about the three steps you can use to control social media overuse. The second step is to quit cold turkey. Don’t delete your profile. You don’t need to do that. A part that keeps people from diving in is that you’re afraid to quit. You don’t want to delete all those years of history. You don’t need to delete your account to quit.